Threat detection and incident response are crucial to any well-rounded security program. But before you can hunt down attackers in your environment, you've got to hunt down the talent, time, and tools required to do it right. And, as most security teams can attest, all three seem to be on the endangered species list these days. That's why Managed Detection and Response (MDR) services are on the rise—they act as an extension of your security team focused solely on detecting and remediating threats, via 24/7 monitoring and alerting, as well as remote incident investigation and response. In other words, they provide the experts and tools. All you have to do is show them where to hunt. 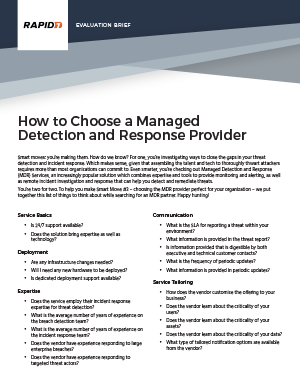 Get a quick primer on Managed Detection and Response, find out why Gartner recommends it, and learn how to pick the perfect provider for your organization—download your free toolkit now! Get to know MDR with Gartner and find out why they recommend augmenting existing security monitoring capabilities with MDR services, rather than investing in more monitoring tools. 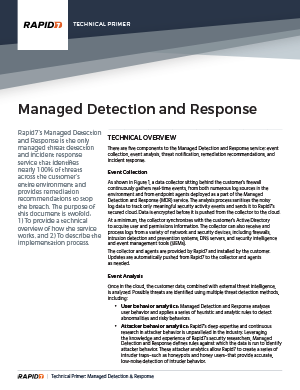 So, you’re sold on Managed Detection and Response. What’s next? Finding the provider that’s perfect for your organization. This quick guide will show you how. 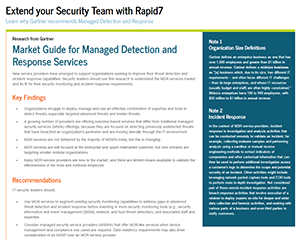 Experience Rapid7’s Managed Detection and Response service from the inside out, with a technical look at how the service works and what to expect from the implementation process. 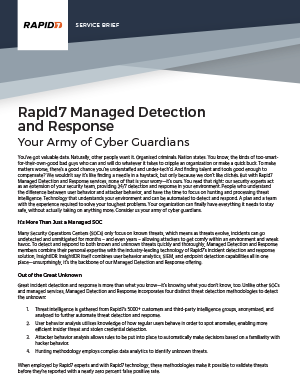 Learn more about Rapid7’s Managed Detection and Response services and how our army of cyber guardians – and deep threat intelligence – can help you detect and eject attackers, 24/7. How do MDR providers differ from Managed Security Services Providers, and which are better? 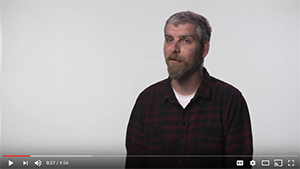 Rapid7’s Wade Woolwine reveals all in this short – but enlightening – video. Rapid7's Mike Scutt highlights the important role user behavior analytics (and by association, attacker behavior analytics) play in Managed Detection and Response. Spend some time with Rapid7 experts David Etue, VP of Managed Services and Kimberlee Bachman, Solutions Marketing Manager to understand how Managed Detection and Response is a modern replacement for MSSP. Wade Woolwine, Rapid7’s Director of Managed Services, joined Paul Asadoorian of Security Weekly, to talk about Rapid7’s cutting edge Incident and Managed Detection and Response products and services.